The coldest show in the world — “ICE AGE”. The tremendous simulation of the frozen world! Ever thought what ice age would be like? To give a unique experience to kids Studio Blocks in partner with Lab of Crazy Scientists is organizing a workshop where in we will be creating the ‘Ice Age’ right in front of the kids. 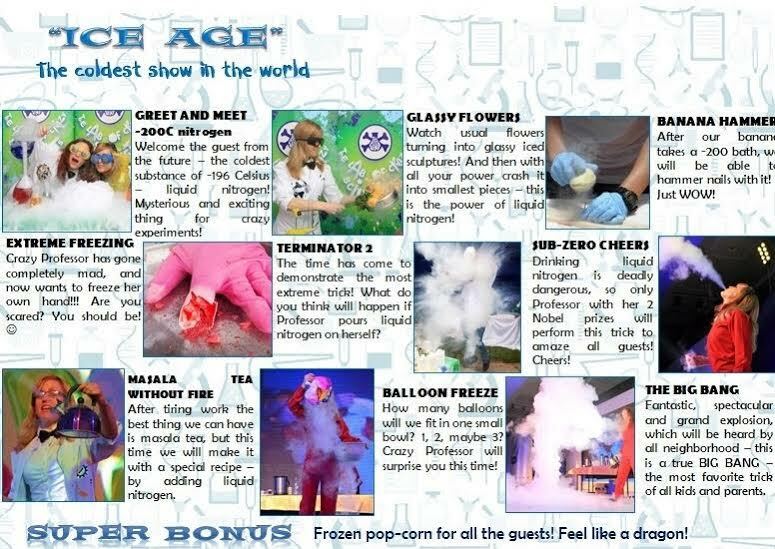 It is a fantastic show with the liquid nitrogen with the temperature of -200C!!! We will be freezing flowers and toys, boiling the kettle and frying food without fire, creating mysterious fog from horror movies and making BIG BANG for the end of the performance! And wait there is more!! How about frozen popcorn for all the guests! Feel like a dragon. “The Lab of Crazy Scientists” is a unique scientific entertaining project, franchised from the most successful show in Ukraine. The concept is based on the adaptation of the most spectacular scientific experiments and promises 100% involvement and fun for kids. How do we register for this…please let me know. We have asked the vendor to contact you. You can call them on the mobile number on the posting or email them at studioblocksjuhu@gmail.com.